Guatemalan jadeite jade in situ. The word ‘jade’ actually denotes two stones, jadeite and nephrite, both of which are accepted as genuine jade. Jadeite, however, is the rarer and more valuable of the two and is what is found in Guatemala. While nephrite is seen in shades of green, white and grey, jadeite displays a spectrum of colors in addition to the famous green, including white, yellow, blue, pink, violet, orange, brown and black. Jadeite is harder and can therefore reach a higher mirror polish. Nephrite polish finishes softer, but the stone itself is tougher and less prone to shattering. Both nephrite and jadeite are metamorphic rocks commonly marked with veins or imperfections, although it is often these imperfections that will make a particular piece special and in some cases more valuable. In general as it is with most stones, a fine piece of jade is distinguished by even clarity of color, translucence, and quality of workmanship. The most coveted jadeite—imperial jade—has a pure green tone striking enough for the ancient emperors of both China and Mexico to place its value above gold. 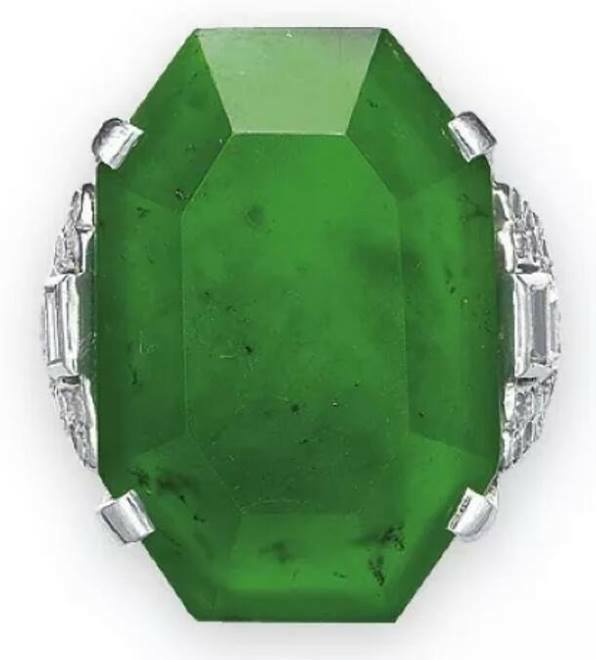 This regal color has only been found in the jadeite deposits of Guatemala, Russia and Burma (now Myanmar), and today can fetch a price to easily rival diamonds. Customarily, green jade (both jadeite and nephrite) has been valued over other colors, but growing interest in less-traditional tints such as blue jadeite (also called Olmec blue), violet jade and ice jade has sparked an off-color jade market. Interestingly, translucent ice jade can arguably be regarded as the purest jade, because it is the imperfections in the chemical make-up of the stone that cause the colors. Mutton fat jade (nephrite) from China. Although jadeite is accepted as the more valuable of the two jades, nephrite holds its own in the jade market. The bright, smooth greens of Canadian and New Zealand nephrite, for example, can create astoundingly beautiful carvings, and the delicate softness of “mutton fat jade” (Chinese white nephrite) is unrivaled throughout the world. In ancient China, mutton fat jade was extremely precious and considered fit only for emperors. As far as we know, the first humans to use jadeite (not nephrite) were the Swiss in roughly 4,000 B.C. Their stilt-houses high in the alpine lakes are thought to have been at least partly built with tools shaped from nephrite and jadeite found in river beds alongside their villages. Their jade axes, hammers, clubs and scrapers were among the first known items of nephrite and jadeite to be fashion by man; the stone’s incredible hardness made it ideal for tools and weapons. At about the same time, the humble tribes that were to become the great empires of Egypt and China were beginning to fashion tools and figurines from local nephrite. Indeed, jade was used all over the world, independently mastered by as many cultures as there were jadeite and nephrite deposits found. Jadeite, even through the Iron and Bronze Ages, proved as useful if not more useful than most metal implements. Not until modern times, with the mastering of metal alloys, was jadeite surpassed as a material for tools. Stunning blue jadeite Olmec mask. In the West, it was the Olmecs of Mesoamerica who were the first to reveal true art within the shape and smoothness of the stone (on the other side of the world, the Chinese have been carving nephrite for at least 7000 years). By the year 2,000 B.C. the Olmecs were already master carvers of jadeite—their exceptional work is still being examined, copied and mimicked to this day. They clearly set the bench-mark for artistry in jadeite, and their carving traditions were passed down for millennia, first to the Aztecs and then to the Maya culture. In fact, Olmec masks, celts, jewelry and other jadeite figures were collected as antiques by these later Mesoamerican cultures—much like their contemporaries on the other side of the world, who treasured surviving artifacts from the collapse of Rome. In whatever form, jade, mined from the Motagua river valley in Guatemala, was the most valuable material in Mesoamerica, and was used for a variety of things both sacred and profane. Often shaped into statues and jewelry for the elite, the finest jadeite would be used to make powerful amulets for sacred rites or burials, while common jade beads were used as a form of currency. Pakal burial mask, found in Palenque, Chiapas, Mexico. Elaborate royal burial masks in many Mesoamerican cultures are made of fine jade, one of the most famous being that of the Maya King Pakal from Palenque in Southern Mexico. The Maya even inserted jade into their teeth. With advanced dentistry techniques, certain individuals inlaid jade stones in their front teeth, which must have been a distinct honor. Despite centuries of European contact with the Chinese and their greatly-honored nephrite, jade (specifically jadeite) was first introduced to the Europeans through the Conquistadors in the 16th century. For the Aztecs, jade was a sacred stone that guided their leaders and had healing properties. But Cortés begrudgingly received the finest imperial jadeite beads the Aztecs had to offer, disappointed in any tribute that was not gold. 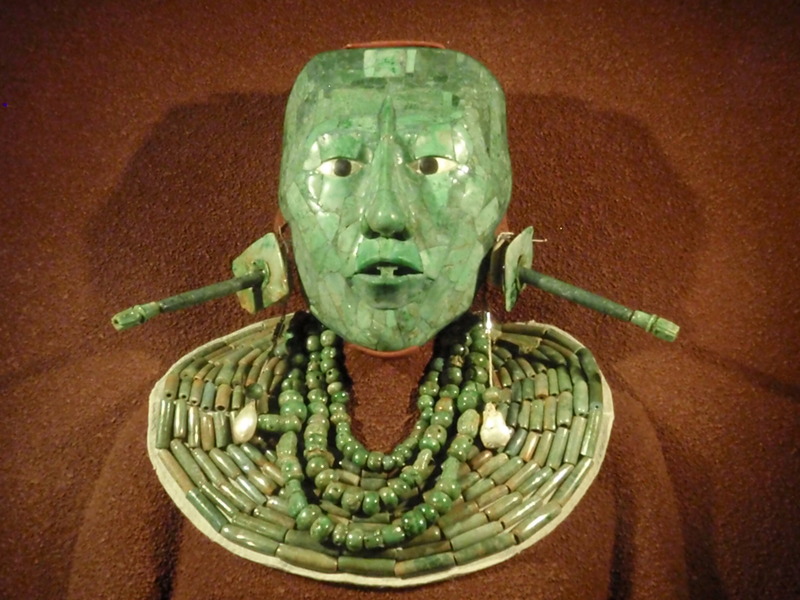 When the Spanish conquest destroyed most of the Maya and Aztec cultures, the artistry of the American jadeite masters was forgotten, along with the location of the great jadeite mines. It was only in 1987 when the source of the Mesoamerican jadeite was finally rediscovered in Guatemala. Thus began the reassertion of American jadeite that continues to grow today. Mesoamerican skull with jade inlaid in front teeth. Not to be ignored in this modern era are the Chinese, whose masterwork in nephrite since before 5,000 B.C. easily translated to Burmese jadeite when it was introduced to them in the 19th century. Today, two hundred years later, they are the current jadeite masters. Their carvings and jewelry, which reflect a grand and ancient culture, are revered and admired throughout the world. Additionally, the Chinese are the largest consumers of jadeite in today’s market, and claim a large portion of the highest quality jadeite found worldwide. Humanity’s relationship with jade has lasted thousands of years, and perhaps for this reason it is seen as such an elemental stone. The deep green color has been associated with the ancient cult of the serpent, and has represented corn, water and life to the Olmecs since the beginning of their history. Beyond its physical characteristics, jade has a strong energy that has been harnessed for a variety of things. For ancient Mesoamerican cultures, jade was used as a stone of magic and power, which was why much of its use was restricted to priests and kings. For instance, placed under the head while sleeping, jade was believed to promote lucid dreaming and the power to use dreams as a means to create and change waking reality. They also attributed jade with bringing good fortune and slowing the process of aging. In gemstone therapy the serene green stone brings a balancing and harmonizing effect, helping release negative thoughts and realize calmness and peace. Emerald jade, or imperial jade, is especially helpful in repairing or fortifying relationships.